Joan! Your drawings are super...seriously. Love this. Nice card! Who needs stamps when you can draw like that? Your drawing and painting are amazing. There you go being all artistic again! "Hope it tickles" would have been great with this. Love the pretty blue tablecloth and your watercoloring. This is just so cool! Joan, I've really enjoyed your original drawings and paintings. Love your cactus pots! Wow! Creative genius. I would say P for proud. Oh wow, Joan - that looks brilliant! Well done you, I am still too chicken to try drawing, even doodling isn't easy. 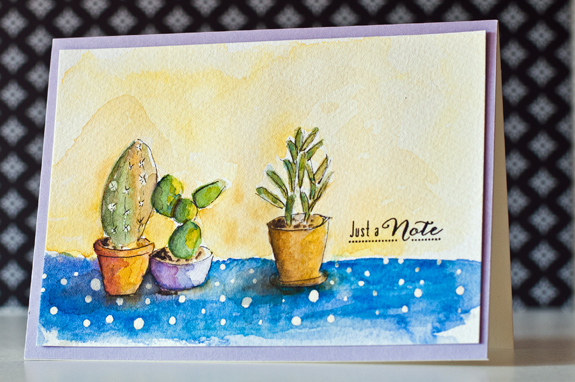 Quite apart from the cacti, I LOVE your yellow background, and the masked dots in the tablecloth. I love your drawing/painting too. It is beautiful. You're doing great! I thought those were stamped! It's funny how I see simple images in a stamp set and have to have it, even though I probably could have drawn them myself. I think you did a wonderful job with the cacti! Love the coloring, too.